Ronaldo, Ronaldinho Gaucho and Adriano did not become overnight stars for the Brazilian national team. All of them first represented their country at Under-17 level, and the experience was invaluable as they made their way in senior football. It would be wonderful if the current star of Brazil's Under-17 side could go on to make a similar impact. Kerlon of Cruzeiro was top scorer in the South American Under-17 Championship, which came to a close in Venezuela on Sunday. He curled home some wonderful free-kicks, outpaced the defence to lob past the keeper and scored with some typical penalty area poachers' finishes. But it is not just his eight goals in Venezuela which will be remembered. The more lasting memories will surely come from his new invention - the seal dribble. Kerlon flicks the ball in the air and runs with it like it is tied to his forehead. He does it quite systematically, a few times in every game, and his close control with his head and overall co-ordination are so outstanding that he can perform the feat at pace or while changing direction. It may sound like a circus trick, but the seal dribble is no laughing matter for the opposition. It is a move which is very difficult to stop by legal means. On the evidence of the South American Under-17 Championship, on the majority of occasions either Kerlon manages to get past the defender or he wins a foul. If he chooses the right time to unleash the move then it is a highly effective weapon. It is truly inspirational to find a young player with the creative genius to come up with such a move. The game is all the richer for improvised and acrobatic inventions such as the backheel, the bicycle kick and the Cruyff turn, and maybe Kerlon's seal dribble can take its place among them. As football looks forward in the search for new ways to win, the game also looks back to honour the heroes of the past - a point also made very clear in the South American Under-17 Championships. 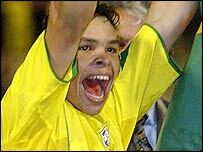 Boosted by Kerlon's goals, Brazil were the champions - but only just. With the last kick of the championship Uruguay's Acosta blasted a free kick against the Brazilian bar. Two inches lower and the title would have belonged to his country. Uruguay's outstanding player was six-goal striker Elias Figueroa, who showed strength, an excellent left foot and the rare gift of having time in the penalty area. His name is already familiar to football fans. The first Elias Figueroa was one of the game's truly great defenders - good enough to represent Chile from the World Cups of 1966 to 1982. He remains an idol in Brazil, where he starred for Internacional, and in Uruguay, where he played for Peñarol. The father of Uruguay's current Under-17 striker is a Peñarol fan who happens to share the same surname as 'Don' Elias. In tribute to the great Chilean he gave his son the name of Elias Figueroa - and by the ironies of football he is turning into a proficient scorer of goals rather than a master of the arts of preventing them. Kerlon's seal dribble and Elias Figueroa the second, stars of the future and heroes of the past were all in evidence in Venezuela at the South American Under-17 Championship. All change in South America?